We stayed one night after attending a Britt performance. The room was big, comfy, clean and had a refrig and plenty of outlets for devices. The staff were friendly and helpful. The included breakfast was disappointing, but other than that, it was great! We were on our way home and stopped for a night here, based on the good reviews. It's very charming, and we had a very restful evening. We want to come back and stay again, so we can explore the cute down town that is within walking distance. We will be back!! Staff was super friendly! I have stayed here many times. The staff is wonderful. The rooms are quiet and clean. I highly recommend the Wine Country Inn. Everything about this Inn is charming! Great staff, the room was amazing and super cute and the small historical town of Jacksonville was enjoyable. We will be back. Excellent Staff, Great Accommodation, had a grand time walking into town and enjoying the historic town. Great staff, nice simply rooms, very clean. We're going to be coming back again! Awesome place!! Just what we needed comfortable and clean. Best place we stayed at on our trip! Super clean and really cute! Love this place! Clean, comfortable and friendly staff! Check out is at 11:00am. If you would like a late check out, please give us a call at (541) 899-2050 at your earliest opportunity so that we can schedule around your desired departure if possible. Pets are welcome at Wine Country Inn in our designated Pet Friendly rooms. These rooms are all on the first floor and have special flooring to assure a clean and safe environment for our visiting pets. A fee of $30/night charged for pet friendly rooms. Upon check-in, your pet will be provided it’s very own welcoming “doggie bag” with items to make their stay more comfortable. Pets may not be left in the room unattended. If your plans include non-pet friendly activities, please feel welcome to contact the front desk about doggie daycare options. Our summers are much too hot to leave your pet in the car. A pet, family and budget friendly hotel in Jacksonville Oregon can be hard to find, but we have you covered! 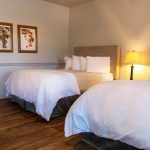 Wine Country Inn offers Standard Rooms with a king or two queen beds, adjoining rooms for larger families / groups, and pet rooms with laminate flooring to keep each room fur & dust free. Also featured are the King Whirlpool Suites, offering extra amenities like an oversize bedroom with king bed, sitting room with gas fireplace, and whirlpool tub in the spacious bathroom. We provide the popular, hotel exclusive Serta Presidential Pillowtop Mattersses in every room. 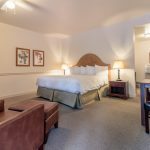 All rooms also include the amenities you come to expect like free parking, high speed WiFi, coffeemaker, refrigerator, flat screen TV’s, USB charging ports, desk, and high end toiletries. We offer a continental breakfast each morning from 7:30am until 10:30am with checkout time of 11am. Available with either one King sized bed or two Queen sized beds, our Standard Rooms are our most economical accommodations. Some offer connecting doors for larger families or groups. 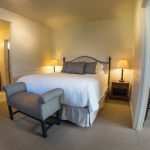 These Deluxe Suites include a bedroom with a King sized bed, a separate sitting room with a gas fireplace and seating area and an oversize whirlpool tub in the spacious bathroom.